Sewing machine manuals are THE most important accessory you can have for your sewing machine. It is an essential “part” in order to get the most out of your machine. If you have lost or misplaced your sewing machine manual, or perhaps bought a used machine that had no manual with it, we can help. 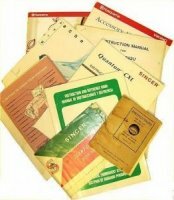 We have access to hundreds of manuals, old and new. Submit the form (below) and we will give you a call back for payment information. The manual will be sent to you then via email as a downloadable .pdf document.